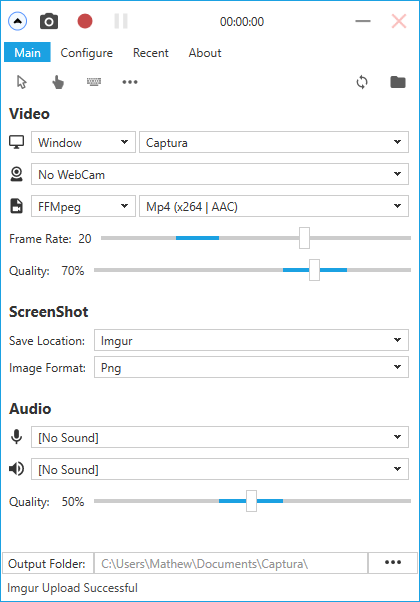 Captura will capture your screen, webcam, audio, cursor, mouse clicks and keystrokes. 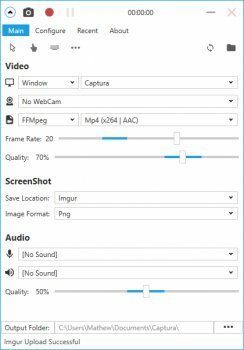 Captura is a .Net application to capture the screen along with audio from microphone and speaker output and clicks and keystrokes. Captura can run unobtrusively remaining minimized to the System Tray. Take ScreenShots and control recordings from the keyboard even when Captura is in System Tray using Configurable Hotkeys. Captura can do the much demanded task of mixing Microphone input audio and Speaker output audio. Capture is a very lightweight and powerful capture utility and it covers a lot of bases. Unfortunately I'm a portable app aficionado and the portable version offered just isn't so. Cons: "Portable" version is not portable. Bottom Line: Capture is a very lightweight and powerful capture utility and it covers a lot of bases. Unfortunately I'm a portable app aficionado and the portable version offered just isn't so.